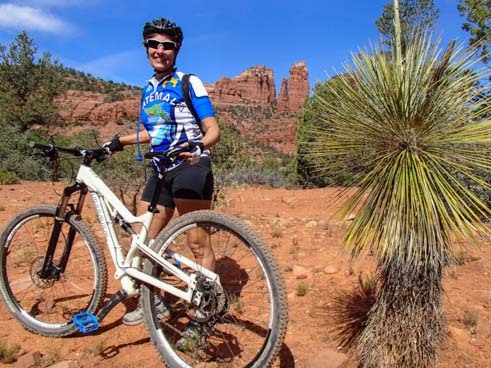 Sedona - Mountain biking in the red rocks! 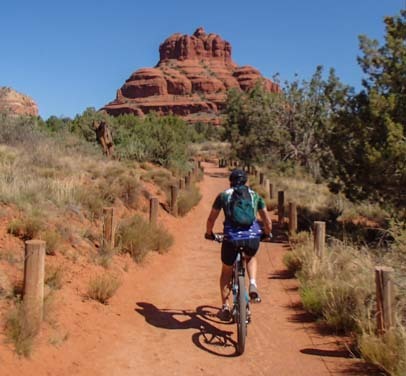 There is only one trail in the main system of in-town trails — the Bell Rock Pathway — that is truly for beginners, and we happily rode up and down that 3.5 mile path many times. What a place to go mountain biking! 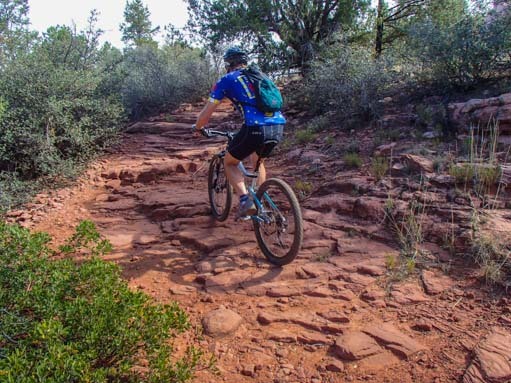 The only obstacle a mountain biker might encounter on that trail is other mountain bikers and hikers, as it is probably the most popular trail in the area. Bus loads of tourists arrive all day long to hike it, and happy vacationers pour out of those buses onto the trail, cameras in hand. They stroll along its length with eyes wide as they soak in the glorious views and pose for photos they’ll share with friends back home. I didn’t mind dodging these folks one bit, as I’m still getting my mountain biking skills together. I creep along at just over a hiker’s pace! Since I am still getting familiar with my bike, I make a lot of mistakes, like mis-shifting and jamming into a big hard gear when I really want to go for a small easy one. forefinger on the left hand! 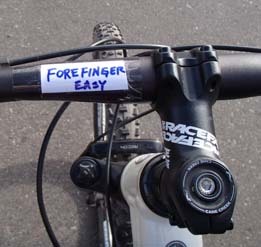 You see, the forefinger of the right hand shifts the bike into a harder gear, while the forefinger of the left hand shifts it into an easier gear. What’s worse, the thumbs do the opposite! Can you blame me for getting confused? Mark just laughs. But my little reminder note sure gave me away as a beginner, especially when we went to the Bike and Bean bike shop where the master mechanic Denis installed a replacement tire after I sliced mine open on a rock!! 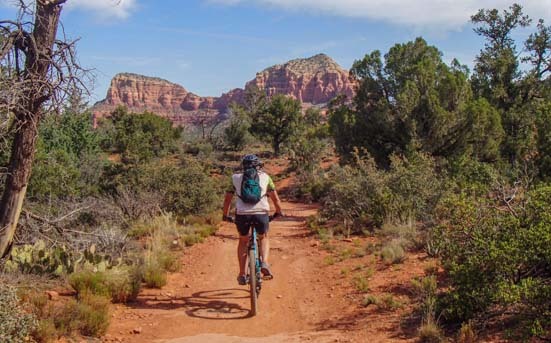 Sedona is considered by many to be a mountain biking paradise — and no wonder!! Tackling rock “stairs” — yikes! However, Mark and Marcel are NOT beginners, and they wanted to sample some of the “good stuff” in the area. They joked about the “nice” trails — in quotes. “Nice” to me was “nice and easy” like the Bell Rock Pathway, and “nice” to them was something that involved rock “stairs” and tight turns and other scary things that make me slam on the brakes and start walking! Of course, I often have the added challenge of choosing to ride one handed. Like a madwoman, at almost every turn I reach in my back pocket and grab my waterproof & drop-proof camera to get a cool photo! Marcel took us on the Templeton Trail, a beautiful trail that wanders through the trees. 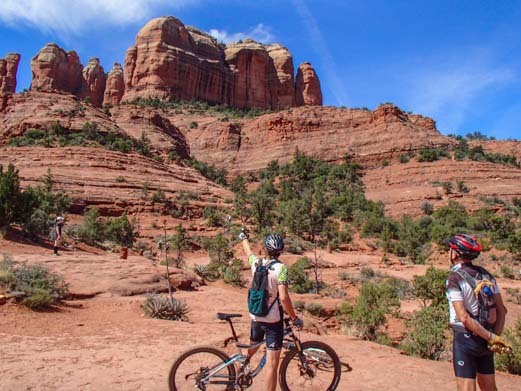 After twisting and turning for a while, it suddenly deposits you onto a thrilling slick-rock path where you wind around the base of Cathedral Rock and arrive at a view that is truly inspiring. This base of Cathedral Rock was so stunning that Mark and I returned on foot to see it again on another very mysterious and cloudy day. 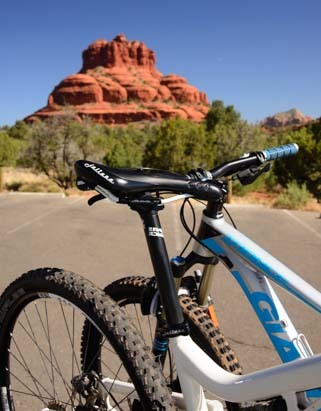 I watch in awe as a mountain biker rides up the “stairs” to Cathedral Rock. 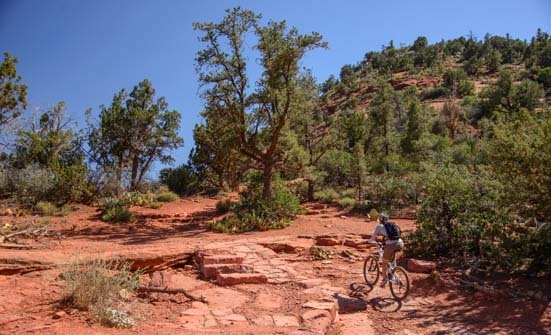 I watched in amazement as two mountain bikers rode up the rock “stairs” with ease and grace. Both Mark and I were inspired to keep practicing on those trails and ratchet up our skills another notch or two. Mark found a particularly gnarly section of trail — one that involved a tight turning descent between boulders followed by a steep turning uphill on uneven stairs — and he practiced it over and over while I offered words of encouragement (so easy to do when you’re not the one on the bike!). On a wonderfully dark and stormy day, a mountain biker rides between the peaks. Mark nails the “stairs”… yay!! He finally nailed it, and I clapped heartily. There wasn’t a trophy or a blue ribbon or even a gold star on the forehead for his accomplishment, but such is the nature of mountain biking. The challenges are set by nature (or by some sadistic mountain bike trail builder), and the satisfaction is solely in being able to rise and meet the challenge and overcome it. 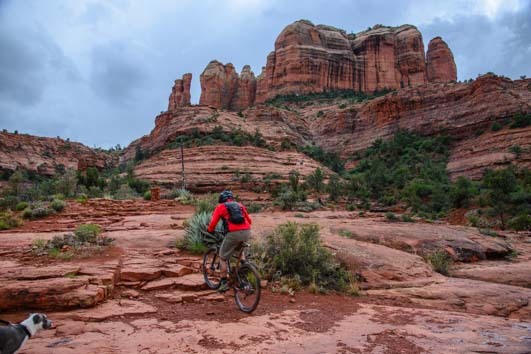 Just like our new sport of mountain biking, Sedona, Arizona, crept its way into our hearts. 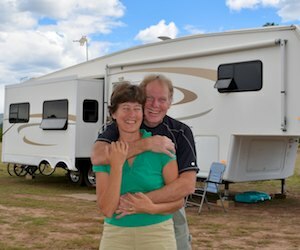 This entry was posted in Arizona and tagged Arizona, Hiking Red Rocks, New, Sedona Arizona, Travel, USA, WP Travel by Roads Less Traveled. Bookmark the permalink.